SuperFogeys - The Redesigned Soviet Sam and Spy Gal! One Year Later, as I’ve mentioned before, means a lot of design work for both old characters and new. In fact, that design work is still an ongoing concern. Sam and Spy Gal were the first two Marc worked on because they were the first to show up, in SF 564. For Sam, I wanted more a Sean Connery look for him, crossed with Col. Tigh on Battlestar Galactica (the new one). I’m a huge Battlestar fan and I don’t mind saying the primary inspiration for the One Year Later storyline was the Season 2 cliffhanger. Sam’s white eyepatch is a nod to that, and a reference you’ll get if you’ve seen the show (but that I won’t spoil here). Marc wasn’t too sure about the eyepatch being white and that’s why you see different versions of it alongside the sketch. Since it was an homage, it was the one detail I insisted on. Actually, that’s not true. Another detail no one has noticed yet are the three little jewels across the top of the eyepatch. There’s a reason for them, but I’m not ready to reveal it. 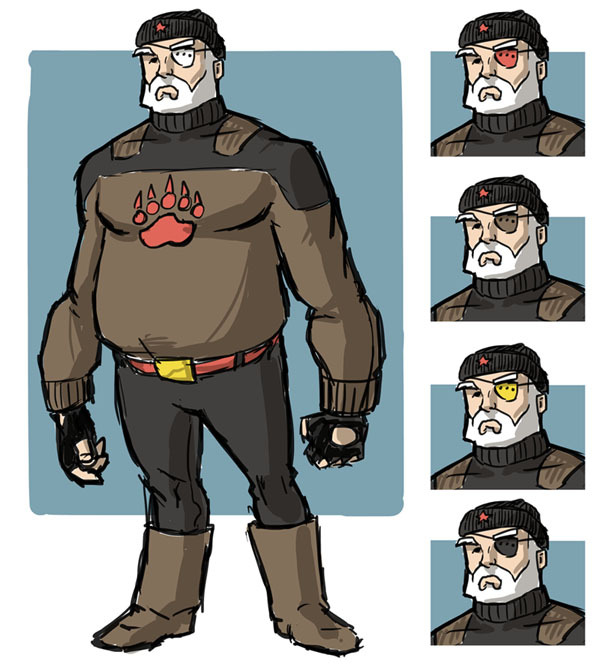 Everything else was Marc’s idea, from the Russian bear theme to Sam’s new hat (I wanted him bald, but Marc proved right away how cool a new hat could be) to how to incorporate a more militaristic look into Sam’s uniform. It’s a radical redesign, but I think I already love it more than his old look. Spy Gal was a bit tougher. The short hair was an idea I had for a long time and I even drew up a sketch to show what I was thinking, but even then I wasn’t sure. I liked the longer haired Spy Gal we’d been getting from Marc up until now. Marc was the one who convinced me to just pull the trigger on the hair, partly because the longer hair is just tougher to draw, but also because the short hair just makes her look tougher. It does make sense for her as a character. She’s more no-nonsense now and I don’t really see her spending the time in the morning to look just right. It fits her new lifestyle. For the clothes, again it’s a more militaristic look. In all ways except one. 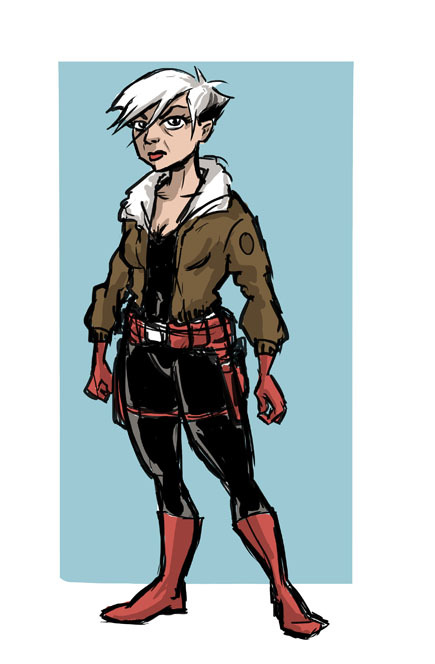 After wearing cargo pants for the last few chapters, Marc brought back Spy Gal’s tights. It’s a small detail and probably not one anybody noticed, but it speaks to her more superheroic roots, which is important to maintain. More sketches to come as more characters are revealed! Well. Sam FINALLY got a new hat, at least.